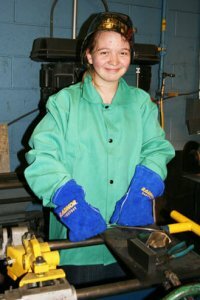 The College Connections program involves between 40 and 50 high school juniors and seniors who study on campus daily for credit in advanced manufacturing coursework. Students travel from their high schools to AMTC classrooms for computer and manufacturing labs. Classes run from seven to eight hours weekly throughout the school year. They can earn between six and ten credits annually toward a certificate and an associate degree in CNC Machining, Welding Technology, and Electronics Systems and Controls. Usually, the participating school systems pay the annual tuition for the students. The local Boards of Education also supply bus transportation on a daily basis. 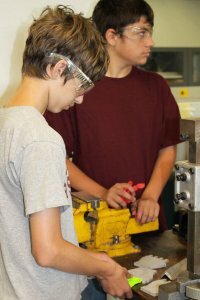 The primary objective of College Connections is to provide high school students with opportunities to consider careers in the advanced manufacturing sector. The effort has proven to be invaluable to young people, their families, school administrators and guidance counselors, the employer community, and the CT economy. The program has been ongoing for ten years and has involved at least ten school systems in area communities around the college. Today, Asnuntuck serves more than 600 high school students. In addition, NVCC and HCC has integrated this program into their Advanced Manufacturing Centers. More and more participants of College Connections program choose to transition to a certificate and associate degree programs after high school graduation. They also become major candidates for private sector-sponsored scholarships that are valued highly by both the student and her/his family. College Connections, together with 30 – 40 private sectors – sponsor scholarships annually, has proven to be an invaluable asset to the aerospace industries and hundreds of other advanced manufacturing companies across Connecticut and Western Massachusetts. All college credits towards degree and certificate programs at Asnuntuck Community College may be applied to the Industrial Technology degree program at the State Colleges and Universities (Central, Eastern, Southern and Western Connecticut State University). UCONN is not included.